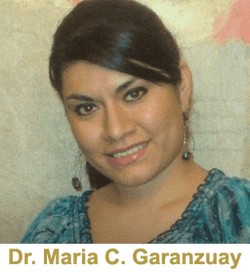 Dr. Maria Cristina Garanzuay graduated with honors from St. Edward's University with a bachelors of science in Biology in 2000. She is a 2006 graduate of the University of Texas Health Science Center San Antonio where she attained her Doctor of Dental Surgery. She worked as an associate for her first 3 years before opening her first location at Windsor Hill. There, her passion for dentistry continued to grow as she built strong patient relationships. In 2013, she opened her second location near the Stone Oak area. She and her husband were married in August 2008 and are the proud parents of 3 children (Enrique Jr., Sebastian, and Anasofia). In her spare time, she enjoys bike riding, cross fit, watching a good baseball game, and interior decorating. Dr. Garanzuay is committed to delivering a personalized and comprehensive dental care while being extremely gentle during her anesthetic process. She believes in giving the highest quality of care honestly and respectfully while providing a comfortable environment for her patients Dr. Garanzuay is a bilingual and speaks Spanish fluently. She believes that hard work, good ethics, and serving the Lord are key to her success. She is a member of the American Dental Association, the National Association of Professional Women, Texas Dental Association, and the Hispanic Dental Association.